On An Overgrown Path: Do great classical composers need the common touch? Do great classical composers need the common touch? Several times I was surprised at the end of a meal by suddenly hearing my overtures; than at the restaurant window, indulging in this feeling, I did not know what was having a more intoxicating effect upon me, the incomparable, magnificently illuminated square filled with countless, strolling people or the music bearing all of this as if in roaring transfiguration. 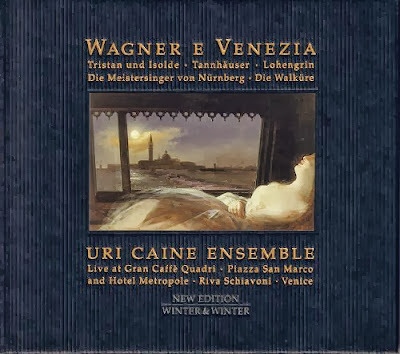 Wagner recounts his time in Venice in Richard Wagner in Venedig by Friedrich Dieckmann. The quote is used in the notes for the Uri Caine Ensemble's arrangements of Wagner for string quartet, piano and accordion recorded live at the Gran Caffè Quadri in the Piazza San Marco, Venice. Forget about the unconventional forces, this is a first-rate and often surprisingly moving Wagner disc which I am sure the Master himself would have approved of. Out of the three great composers celebrating anniversaries this year, Wagner and Verdi reached huge audiences thanks to their common touch being exploited in arrangements for popular forces. Britten comes from a very different era, but can anyone name a popular cover version of a Britten work? Is it because times have changed and social media has replaced café musicians as the preeminent popularising force? Or does Britten's music lack the common touch? But please read on before answering those non-rhetorical questions. Because in a depressingly po-faced centenary year it was refreshing on Saturday to find the Britten thought police taking the evening off and six musicians from disciplines as diverse as folk, house, techno and electronica being invited to reinterpret Britten at Snape. Listen to a demo of Britten's arrangement of the folk song O Waly Waly in what Wagner would term "a roaring transfiguration via this link. Then do share your views on whether great classical composers need the common touch. Have you seen Wes Anderson's film "Moonrise Kingdom"? Britten's music not exactly transcribed - but imaginatively re-used in a way that shapes and colours the entire film. Not what you expect in a big-budget release starring Bruce Willis and Bill Murray. Maybe we're still too close to Britten (and there's no getting around the fact that he's still in copyright) to begin really reinventing him but there's evidence that certain works - the War Requiem, the Young Person's Guide, the Simple Symphony, the Sea Interludes, perhaps - are being absorbed into the texture of our general culture; becoming common property. Only once they have can the reinvention really begin. Give it time, and let's see. Oh, Bob, the answer to this one is obvious and has nothing to do with social media: Britten lived in the age of radio and recordings. During his lifetime, you could hear his music without being in the same room as the performers, in which I include "playing his music yourself." Those arrangements of Verdi and Wagner for mandolin quartet and unusual-to-us groups of winds existed to spread the music to people who couldn't get to the opera house but wanted to know the music (and of course to make a few bucks for the composers and publishers). You are, of course, quite right Lisa. It is just that I am concerned that, despite the proliferation of technical possibilities, we have not found an equivalent of the café orchestras and broadcasts/recordings for successfully promoting classical music. The reinventing Britten project did seem an interesting experiment in tackling that problem.